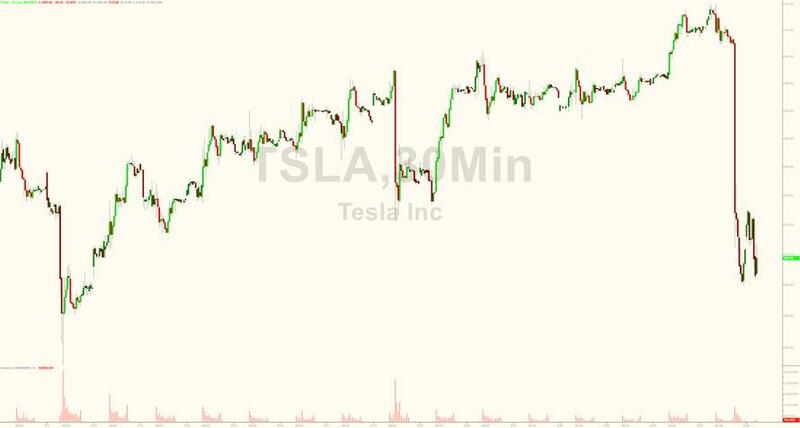 Tesla shares have continued their plunge this morning, down nearly 13% from the Thursday close in the aftermath of the SEC securities fraud lawsuit aimed at Elon Musk directly, as investors realize that in addition to seeking unspecified monetary penalties, the regulator will ask a judge to bar Musk from serving as an officer or director of a public company. Predictably, the Tesla Board doubled down in its defense of the embattled CEO, saying that it is "fully confident in Elon, his integrity, and his leadership of the company", however doubt is creeping that Musk may soon no longer be part of the company that made him a household name, and with it come estimates of just what Musk's value is to Tesla. In a note titled "Lawsuit Secured", Barclays tries to calculate precisely what the Musk "premium" is, which it calculates at $130, and writes that "should the SEC be successful in barring Mr. Musk from serving as an officer or director, investors would focus back on the value of Tesla as a niche automaker, rather than a founder-led likely disrupter of multiple industries." 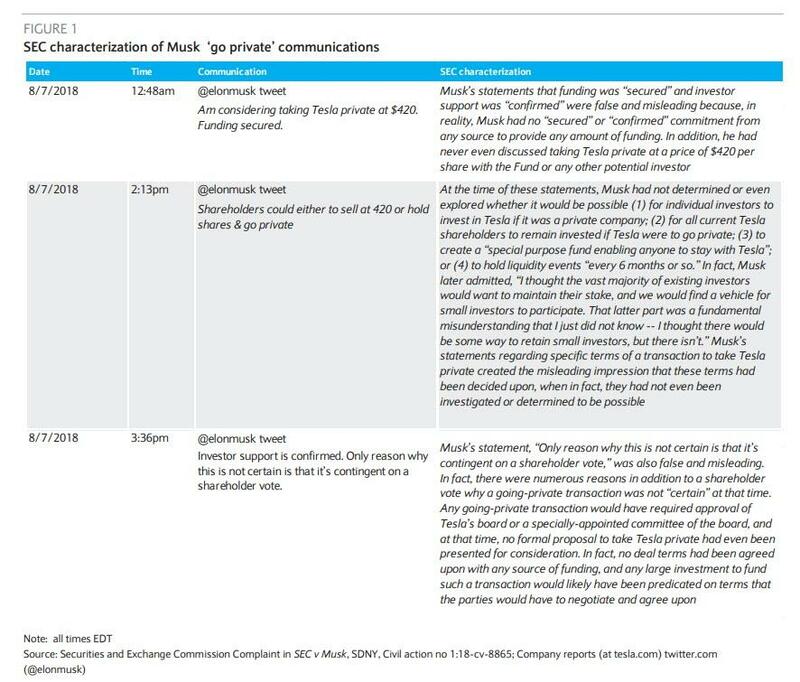 In the sarcastically-titled note from analyst Brian Johnson, Barclays first breaks down the key aspects of the the lengthy SEC complaint, which appears to have been based on Tesla emails, texts, and perhaps interviews with Mr. Musk and board members, and which alleges that Mr. Musk’s tweets on Aug. 7 were "false and misleading." Last week, we hosted a conference call with Daniel Walfish, a lawyer at Walfish & Fissell with 5 years experience at the SEC’s Enforcement Division. During the call, Mr. Walfish laid out the key elements of a 10(b)(5) violation include that the statement was material (which the go private tweets were) and were made with “scienter” – which is not just full blown intent but includes recklessness. Recklessness was described by Mr. Walfish as behaviour that departed from the standard of ordinary care in such an extreme way that the conduct represented a danger to the market. This likely explains why throughout the SEC complaint, the SEC claims that “Musk Knew or Was Reckless in not Knowing that His Statements were False and Misleading. Furthermore, as Johnson notes, by choosing to take its case to the SDNY, as opposed to pursuing a negotiated settlement, the SEC is "unlikely to settle for less than a offer/director bar for some extended period of time (as opposed to just modest monetary penalties). As such, while Tesla may still have value as a niche automaker, the premium the shareholders have been willing to pay for future founder-driven business optionality is likely to dissipate." But what is the Musk premium? In attempting to calculate this key intangible to the Tesla stock price, Barclays writes that one of the key tenets of confidence of Tesla bulls is that the Model 3 and its successors will be the iPhones of cars. Tesla will be a dominant market share player in the mass market auto industry, similar to the iPhone in the cell phone business. And this was supposed to become clear to us non-believers with the Model 3, with its over 400k reservations for a “$35,000” car propelling Tesla into the heart of the global auto market (call it a “Camry killer”). Tesla will disrupt other industries, including trucking/transport, mobility, energy generation/ storage, and even insurance – not to mention whatever the company sets its sights on in the future. What does that mean in monetary terms? As Johnson explains, his below-market valuation of $210 gives credit to Tesla for becoming a large niche player (840k units), "but even that discounted back gets us to only $143 in current value – meaning even we accord some small probability to becoming a far larger automaker and beyond. Inherent in even a $276 stock price is thus over $130 of value for what the market clearly continues to ascribe higher probabilities to the ‘blue pill’ outcomes." Translated: while the 12% overnight drop is bad, should Musk be barred from operating at Tesla, the downside is at least another 50%, with the stock eventually settling around $140.